Pradeep KS is a photographer and freelance designer. His primary focus of inquiry is the shifting, ductile and transitory nature of the modern metropolis, as represented by its decay as well as its renewal and germination. He is particularly drawn to the rituals that lie beneath the veneer of urbanity with which the city clothes itself; the daily baptisms, bloodletting and antique liturgy that invigorates its being. In his efforts at documenting this quality of the metropolis, Pradeep spends significant portions of his time flitting about urban settlements and the exurban satellite clusters that are held in their gravitational pull. 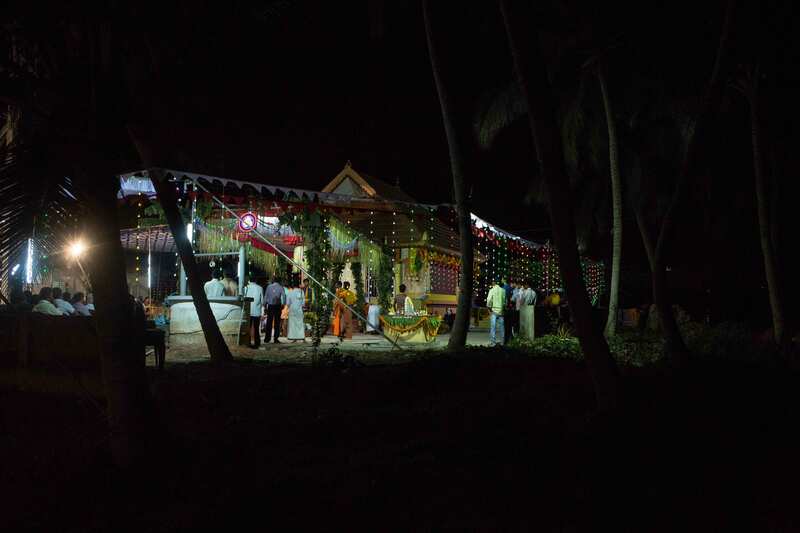 Tuluvas (speakers of the Tulu language) and the Tulu culture are native to Dakshin Kannada and Udupi districts in Karnataka, and Kasaragod district in Kerala. 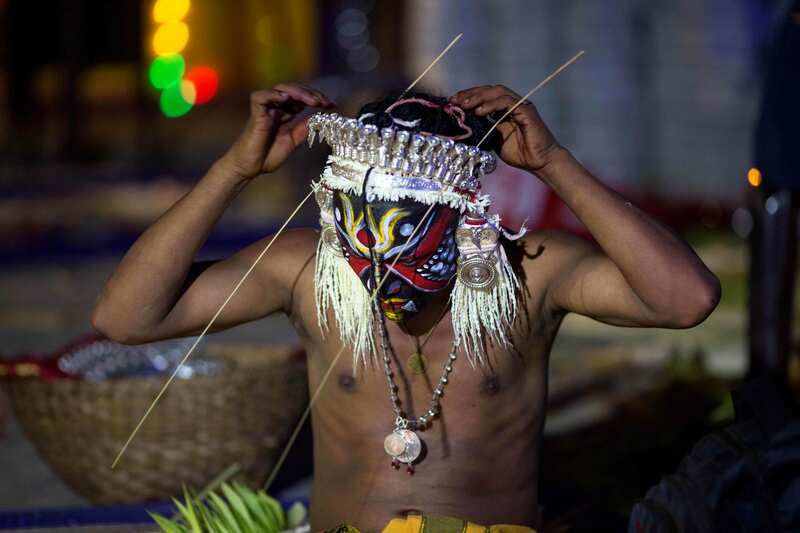 This region has evolved various forms of performance-based rituals invoking spirits, ancestors, heroes, animal deities, forest deities, mountain deities, earth deities, and tribal guardian deities. 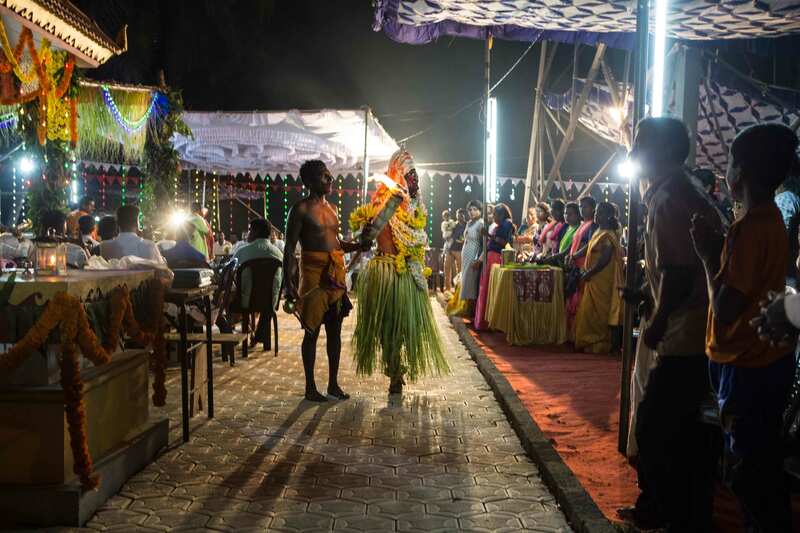 The Tuluvas engage spiritually with a host of local spirits and deities during the annual celebration of Bhuta-Kola: bhuta meaning spirit and kola meaning play or performance in the Tulu language. 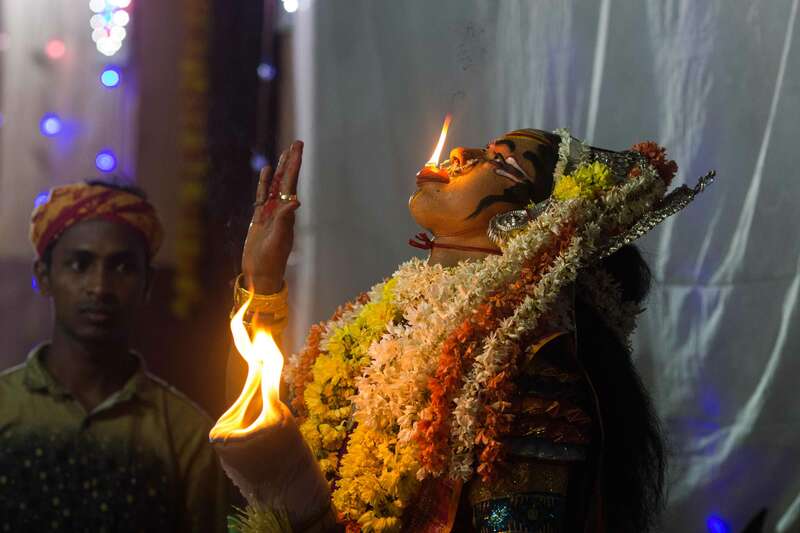 During the ritual, oracles summon bhutas and are temporarily possessed by them, forecasting future events or acting as mediators to provide moral guidance and resolve legal disputes. 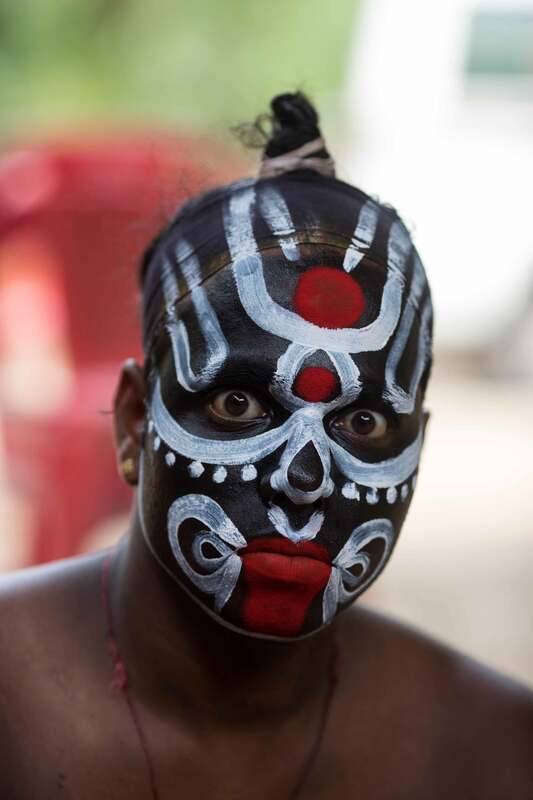 The bhutas, also known as daivas, are semi-divine spirits distinct from humans and gods. The stories of bhutas are often based on historical figures who performed heroic deeds and achieved martyrdom in the past. 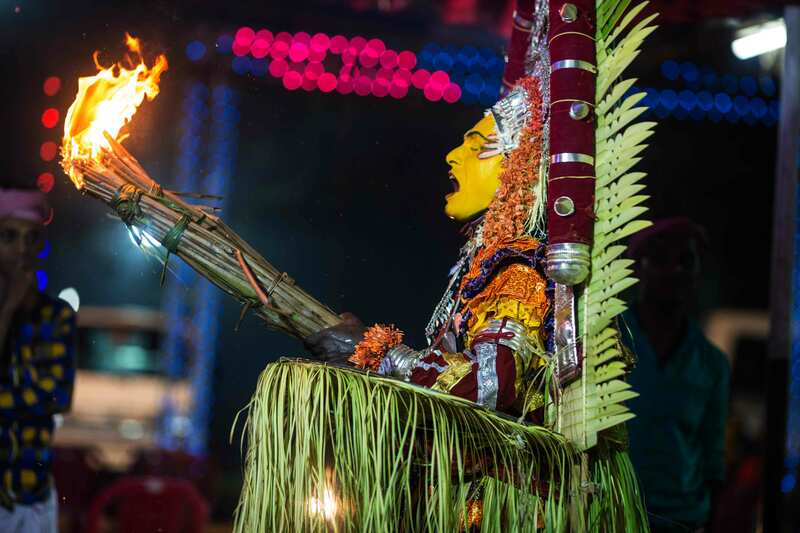 The bhuta performance is called nema, originating from niyama (meaning rules and regulations in Sanskrit). During Bhuta-Kola, a great variety of bhutas are invoked, and each bhuta has specific associations with particular castes and communities. For example, Okkuballala and Devanajiri are Jains, Kodamanitaya and Kukkinataya are Bunts, Bobbariya is a Mappilla, and Nicha is a Koraga. Some bhutas are female, like Manthra Devathe and Kallurti. 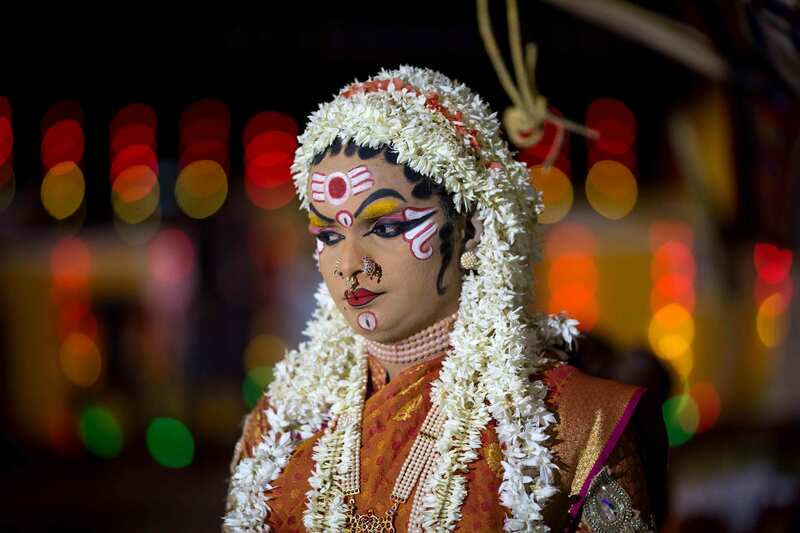 Some bhutas, like Jumadi (also known as Dhumavathi), are androgynous—possessing both male and female characteristics like breasts and beard. Bhutas can also be in animal form, for example, Pilichamudi is a tiger and Malaraya is a boar. 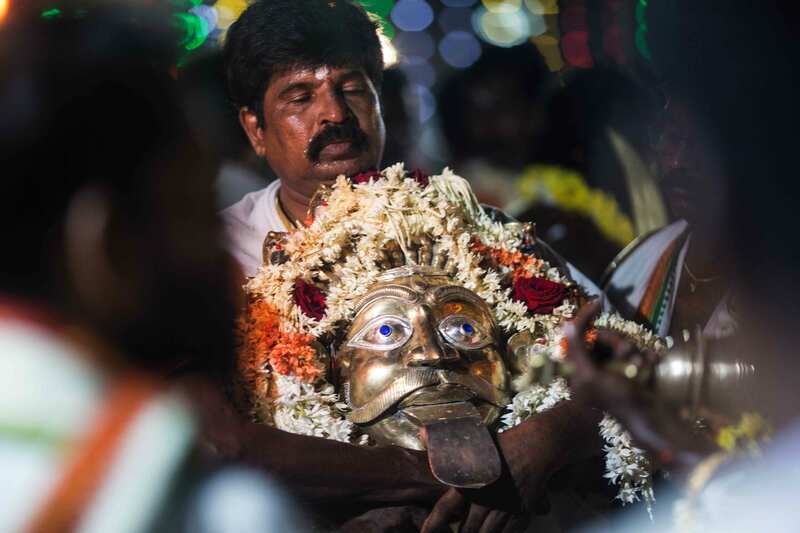 However, unlike gods who are worshipped throughout the year in temples, bhutas are invoked only during Bhuta-Kola or other specific occasions. 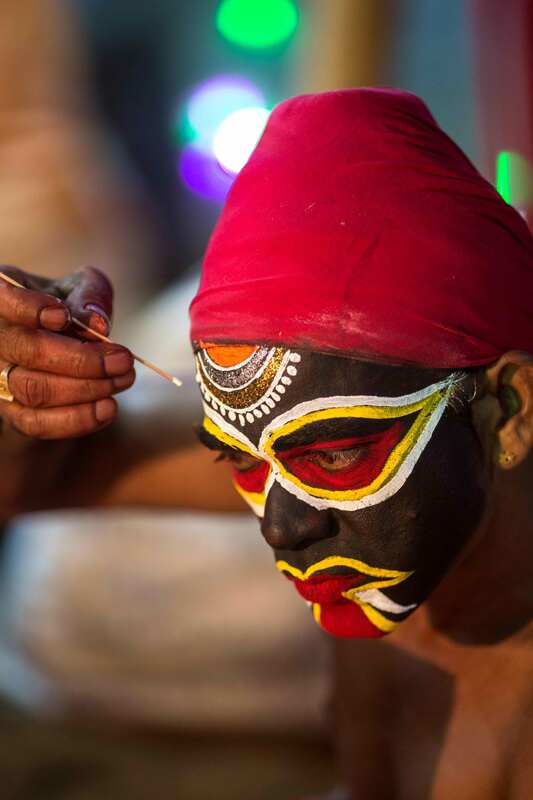 In Bhuta-Kola, the performer does not represent the deity; instead, he is only temporarily possessed by the deity. It is interesting to note that these oracles, till recently, came from non-Brahmin castes and have traditionally belonged to scheduled castes like the Pambada, Nalike or Parawa. 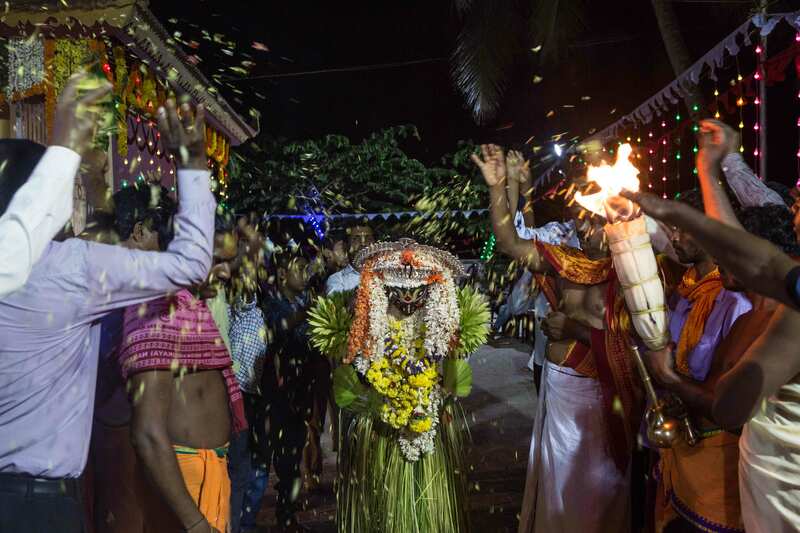 I made a couple of trips to villages around Mangalore (Barla Guthhu in Bantwal taluk, Dakshin Kannada and Mansa Punnodi, Kavoor) to document Bhuta-Kola rituals. To understand the performances better, I reached the venues early and got schedules of the events in advance. Because many of the oracles/impersonators do not like their privacy being invaded or their pictures being taken, it was not easy to photograph them. As I talked to them, they eased to my presence and I came to know the number of bhutas participating, their names, and other details like their origin stories. 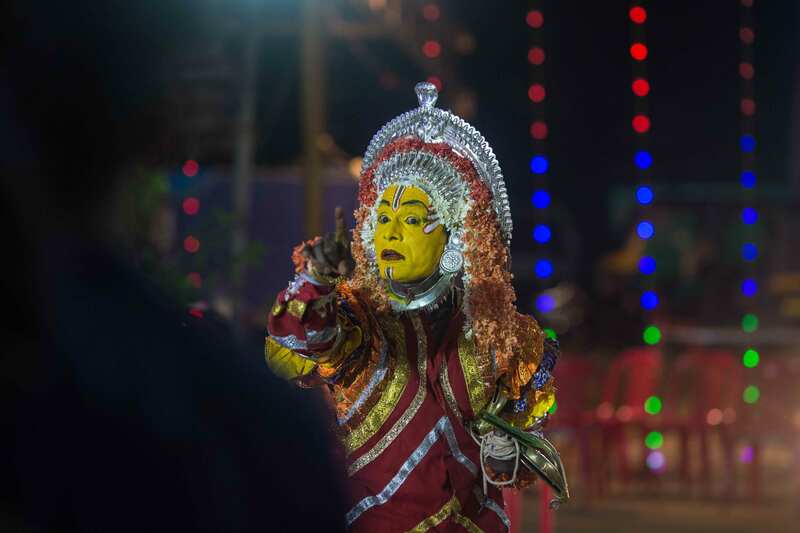 Bhuta-Kola is not a typical dance performance meant for entertainment, and not a stage act done by professional actors. 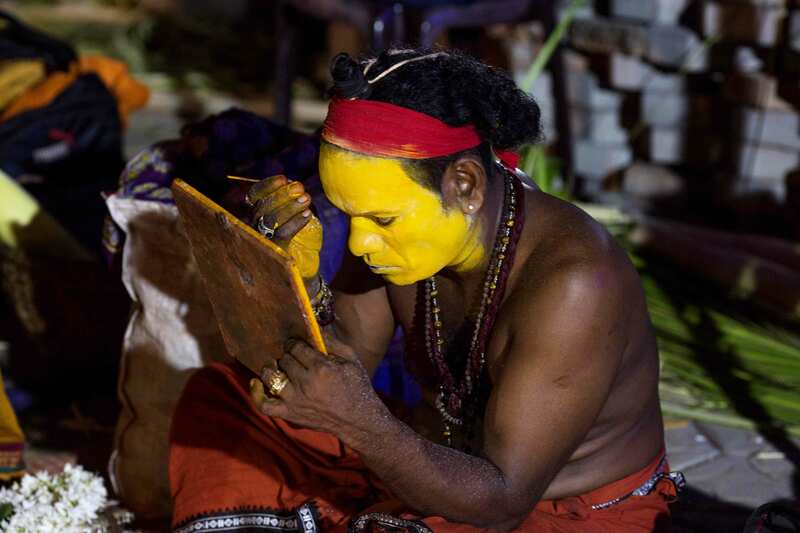 It involves a complex set of rituals that are specific to the bhuta being invoked. 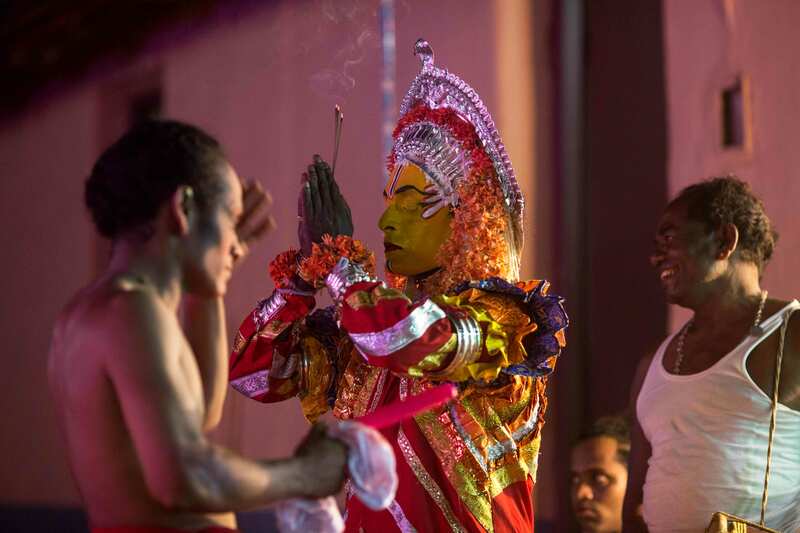 Performers have to undergo spiritual training and observe several restrictions for their role. 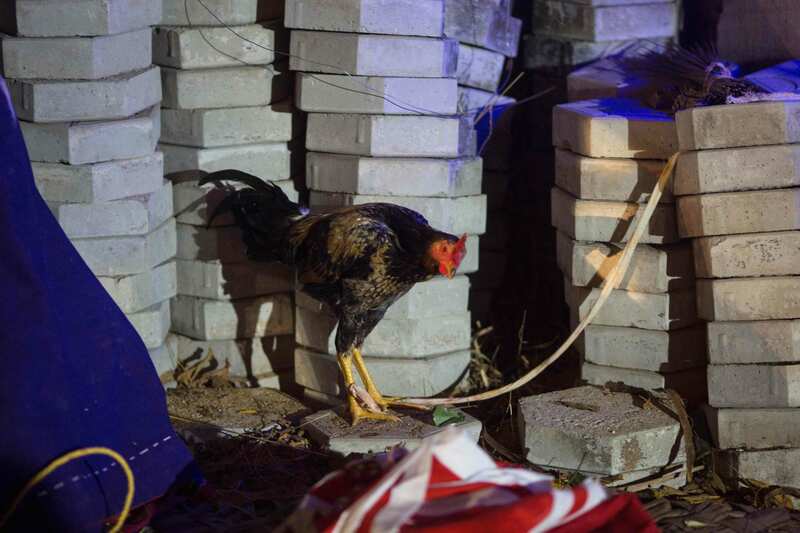 They follow a strict regimen that prohibits them from eating meat, consuming alcohol or engaging in sexual activities. 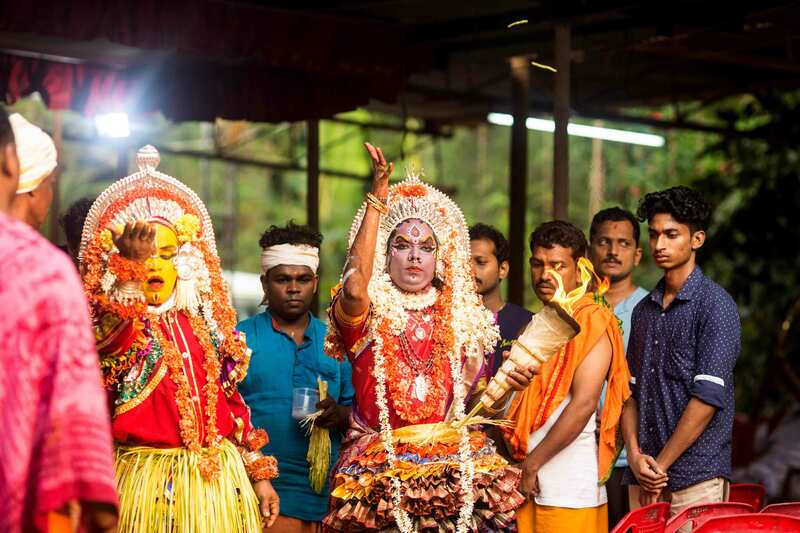 During Bhuta-Kola, paddanas (oral epics) written in Tulu are recited, which narrate the origin and various exploits of the deities. According to the paddanas, the cosmos is divided into three distinct realms: gramya (cultivated lands), aranya (forests) and bhuta (spirits). The gramya realm, which symbolises order and civilisation, is engaged in constant conflict with the aranya/jangala realm, which represents the untamed forces of the natural world. The aranya realm and its inhabitant wild animals threaten to destroy the agricultural lifestyle of the gramya realm unless the gramya realm invokes the spirits of bhuta realm. Devotees believe neglecting the bhutas will lead to bad fortune, and so they must be appeased. Hence, the bhuta realm helps in maintaining a balance between the other two realms. If the balance is disturbed, then the spirits become upset and malevolent; but if the balance is restored, then the spirits become benevolent and kind. Therefore, the spirits are not representatives of either good or evil, or positive or negative forces. Their main objective is to maintain cosmic balance and deliver justice in society. 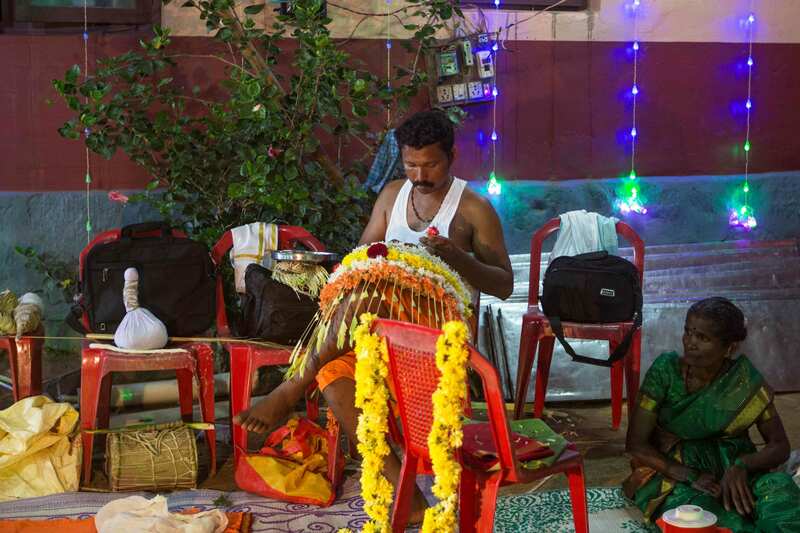 The Bhuta-Kola ritual is usually performed during the months of December to May. 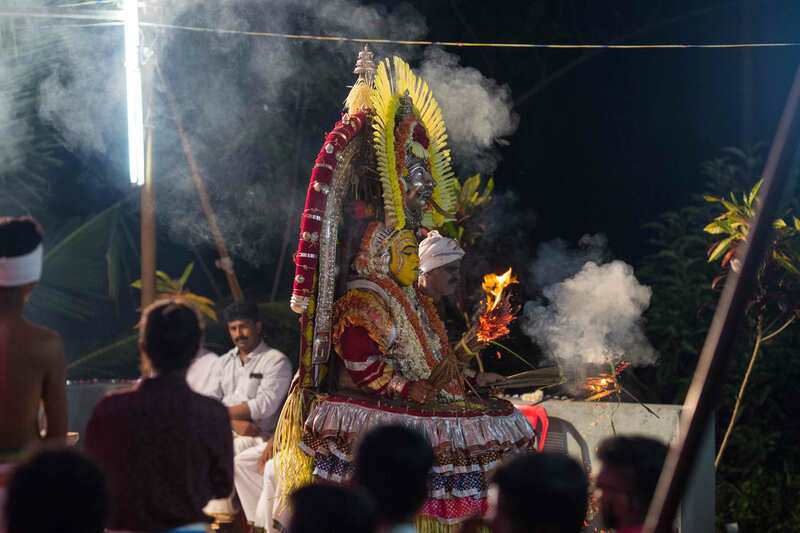 After fixing the date of the festival in presence of the chieftain and the villagers, the bhuta impersonator offers prayer and kailu kadpuna (a fresh banana bunch), which marks the formal inauguration of the festival. Next, depending on the ruling star of the deity, the dompo murtho (auspicious date to start erecting the pandal) is fixed. 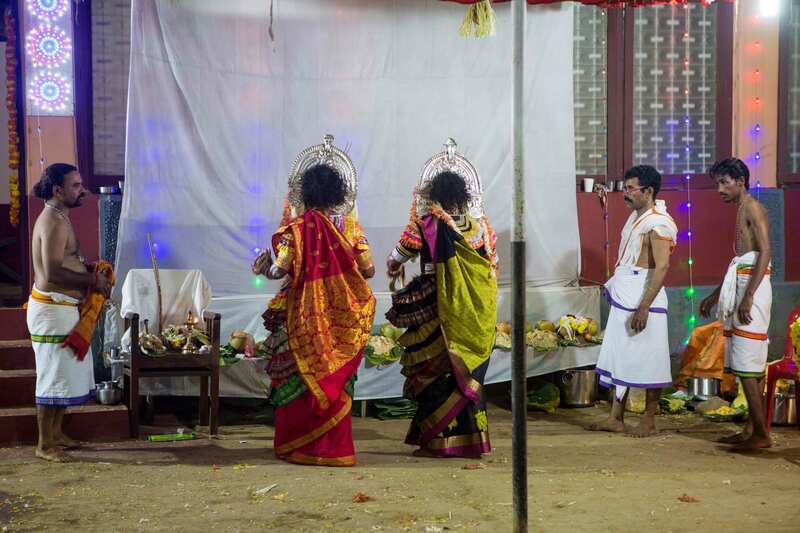 The ritual begins by bringing in all the bhandara jappuni or kirval jappuni (regalia and accoutrements) of the daiva to the shrine where the festival is to be held. 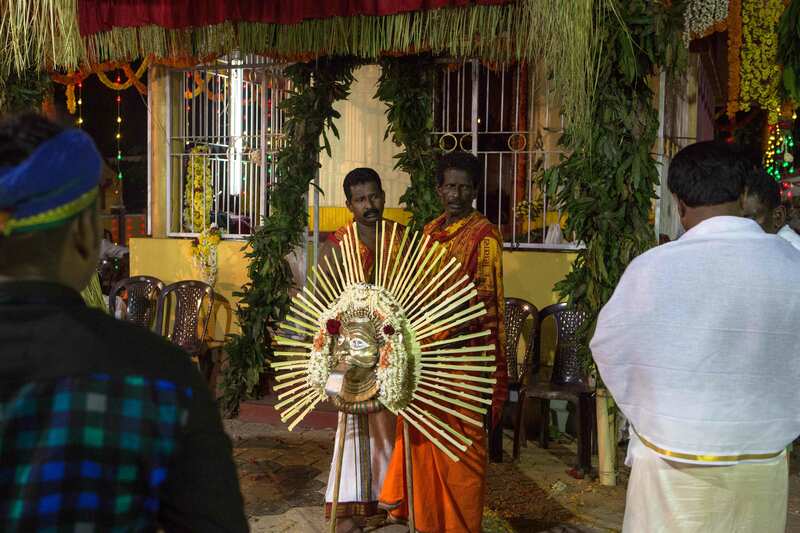 After hoisting the kodi eruni (flag), the base of the flag post is converted to a peetha (a pedestal for the installation of the paraphernalia of the deity). 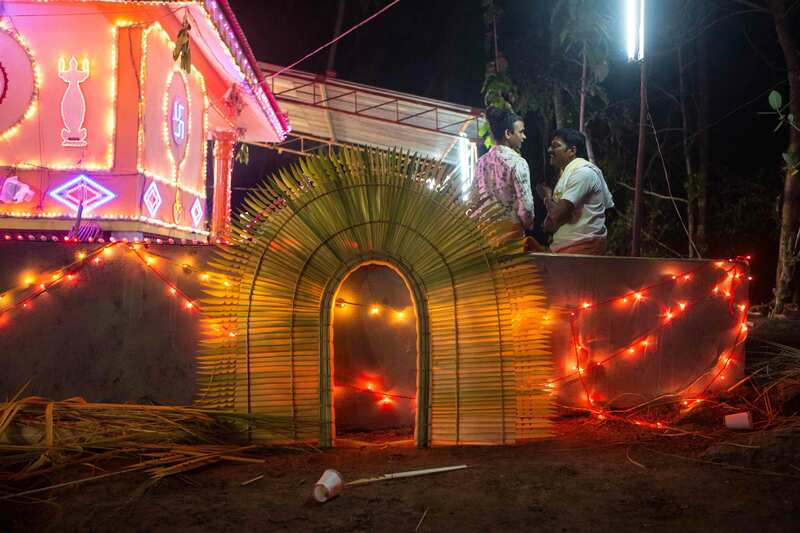 The peetha is decorated with fruits, such as coconut, areca nut, banana, sugarcane, or heaps of rice/paddy. 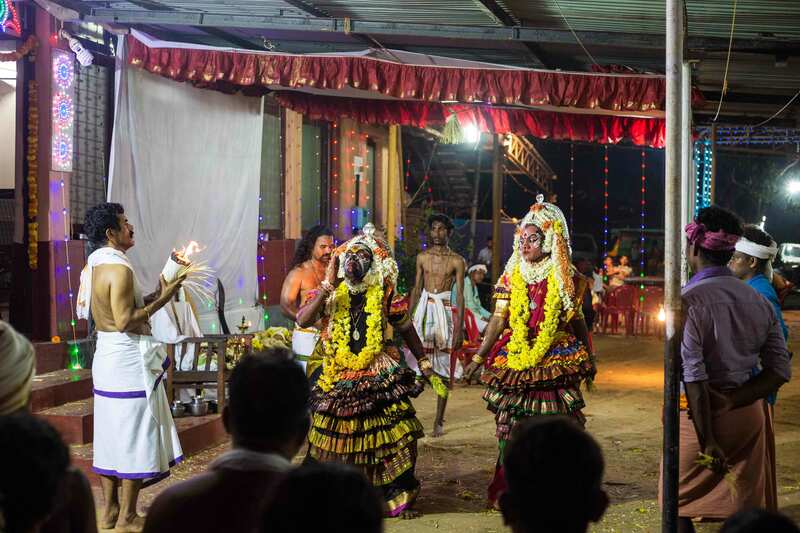 The venue where the bhuta impersonators dance during the performance is called kodiyadi (under the flag), and holy water is sprinkled around it as a purification ritual. 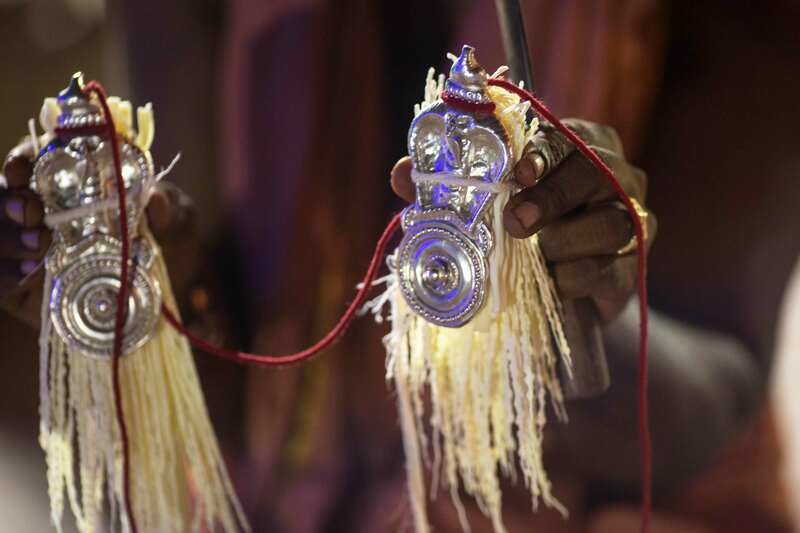 The process of impersonation begins after the paraphernalia of the deity has been installed on the peetha inside the kodiyadi. 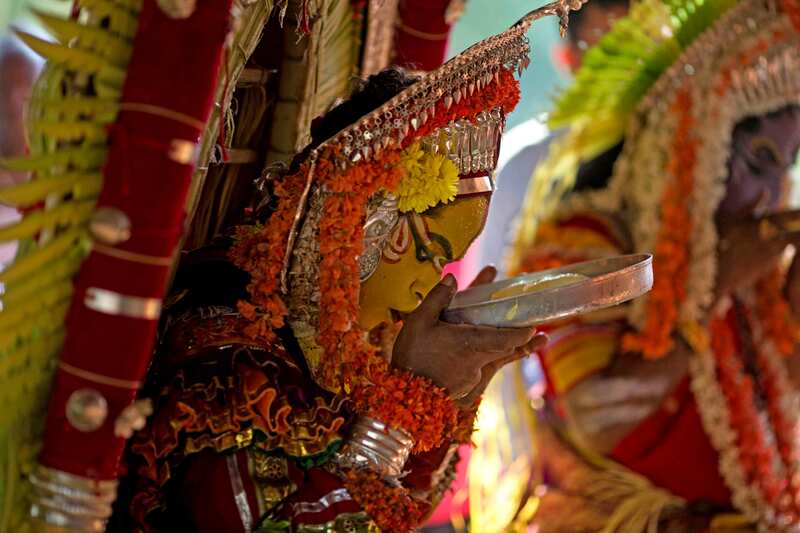 The supernatural qualities of the deities are dramatised through make-up, heavy costumes and silver jewellery. Various bodily accessories are made from fronds of coconut and areca trees, banana plant, wildflowers and bamboo shoot. 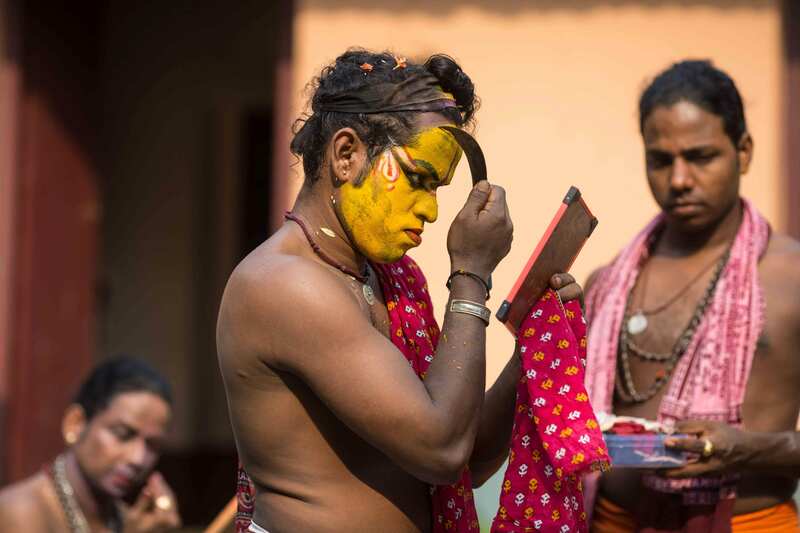 This ritual of applying facial make-up is called ardalada paduni and is accompanied by certain portions of the paddanas called osayo sandhi, which are recited by his family members. Seeking the consent of the people assembled there, he applies the oil on his body and then starts singing the osayo sandhi, accompanying the song with his own playing upon a small drum called tembere. 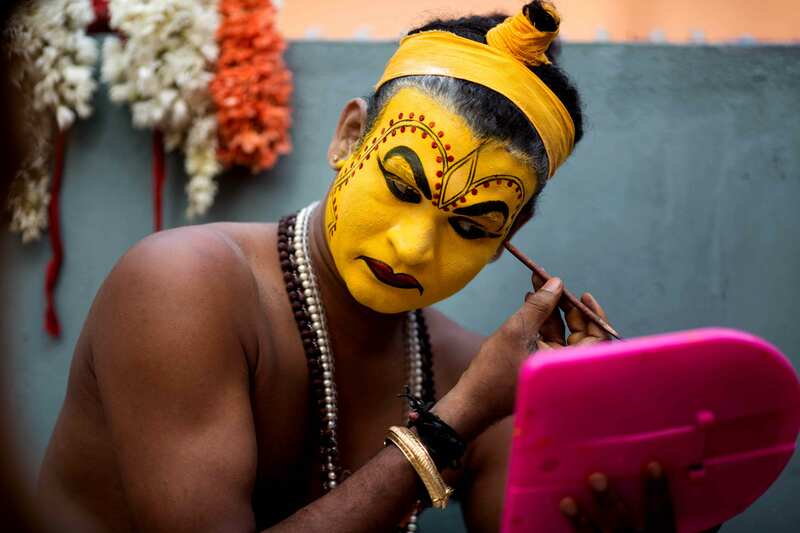 The impersonator is helped by his kin (mostly young male members of the family) in carrying out errands and putting the costume and make-up on his body. Through such assistance, young boys learn about the art so that one day, they are capable of invoking the spirits themselves. 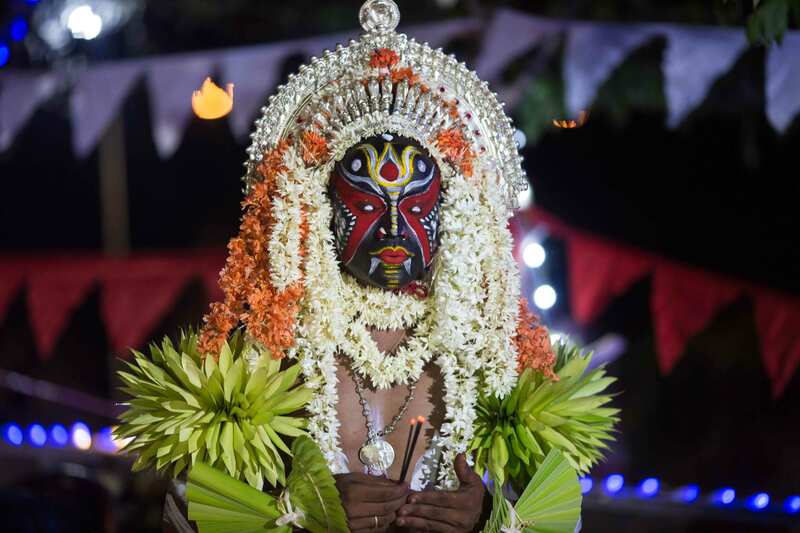 On completion of the make-up and costume, the impersonator is presented with gaggaras (anklet) and the ritual is called gaggaradechchi. 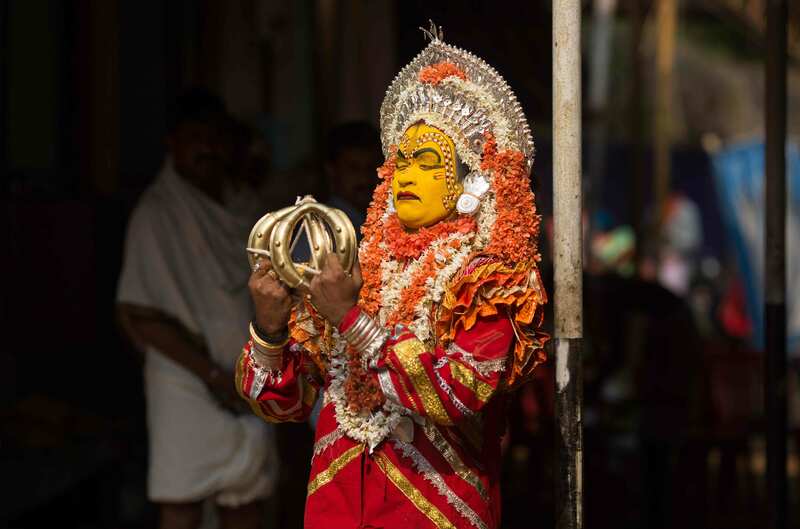 Next, the impersonator puts on the elaborate dress, headgear, the halo-like structure called ani, and other ornaments. He is then presented with weapons and the mask in a ritual called nemadechchi. 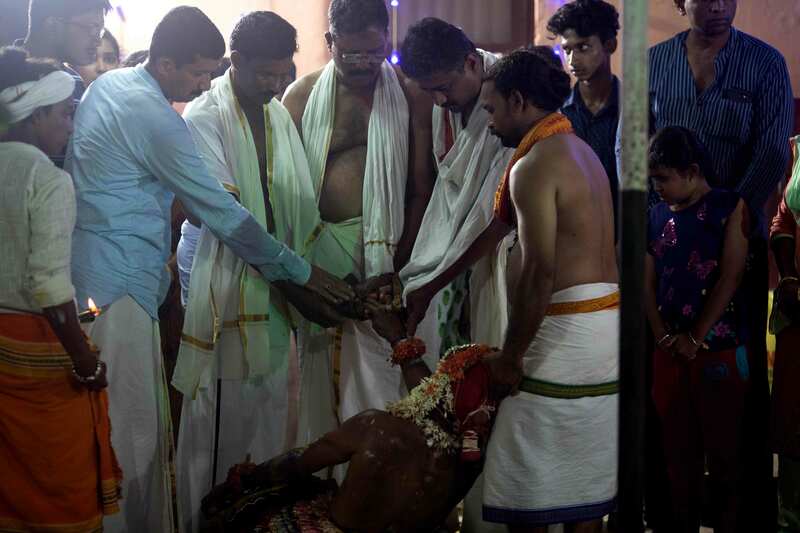 Now fully transformed, the impersonation is ritually sanctified by the assembled village headmen and other dignitaries. 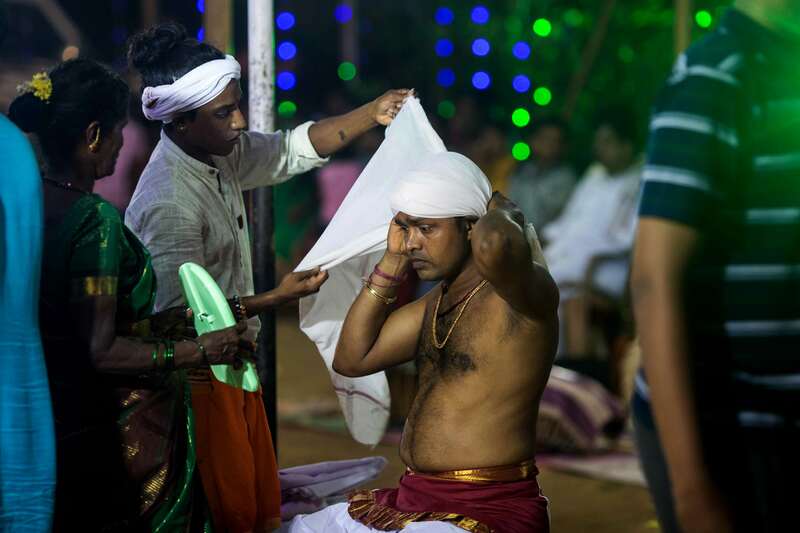 This ritual is called ‘poo ari paadune’ (bestowing the impersonator with flowers and rice). 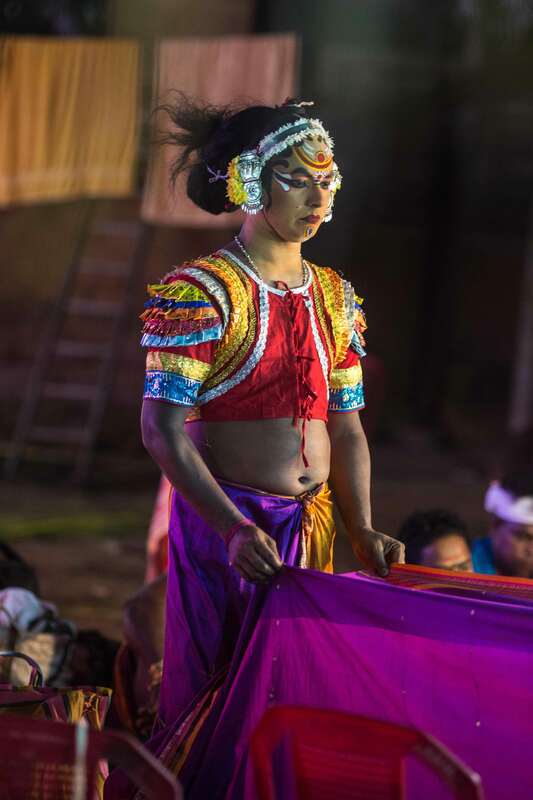 With ornaments and outfit on, the bhuta impersonator displays a variety of dances in the arena. 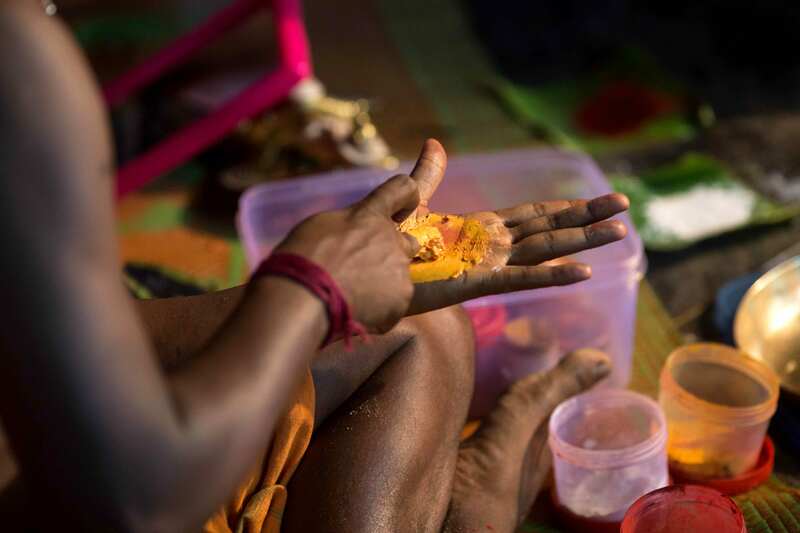 He is helped by the yajaman (head patron of a yajna, a sacred fire ritual) and patri (mediator), who hold torches and make various offerings to the bhuta. A subsequent court of justice provides a chance to the villagers to obtain blessings from the bhuta, and ask for relief from their problems. Judgment is pronounced orally after the aggrieved parties have been heard, but can also be adjourned if the dispute is a complex one. Land disputes, family feuds, robbery, debt, mortgage, breach of contract, etc., are the most common grievances put forward for resolution. The rajan-daiva (royal daiva) is the family deity of most of the rich landowners of the Bunt caste, whose position and power they reflect, confirm and renew. Today, in a democratic system of governance, feudal hierarchies no longer exist, and so the former ruling families no longer hold political or judicial office. 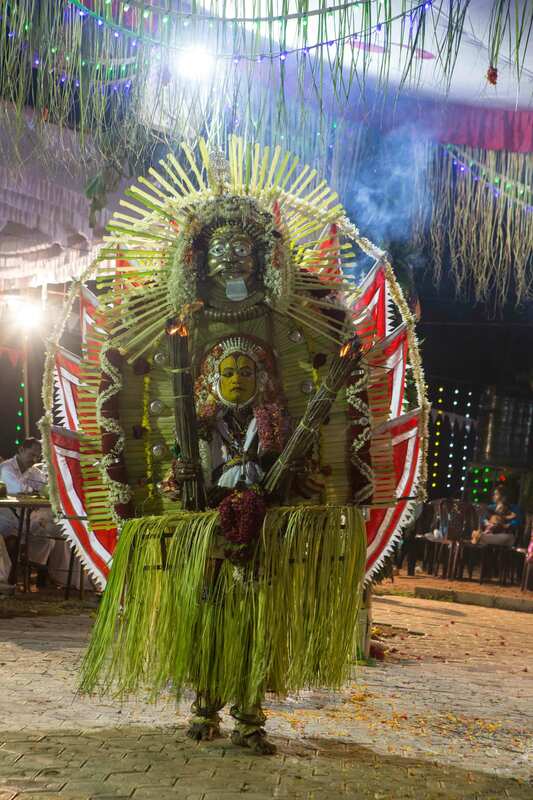 Still, the villagers demand that they sponsor their annual Bhuta-Kola to honour the village deity. By staging the kola, the manor head seeks to symbolically proclaim himself the legitimate leader of the community. 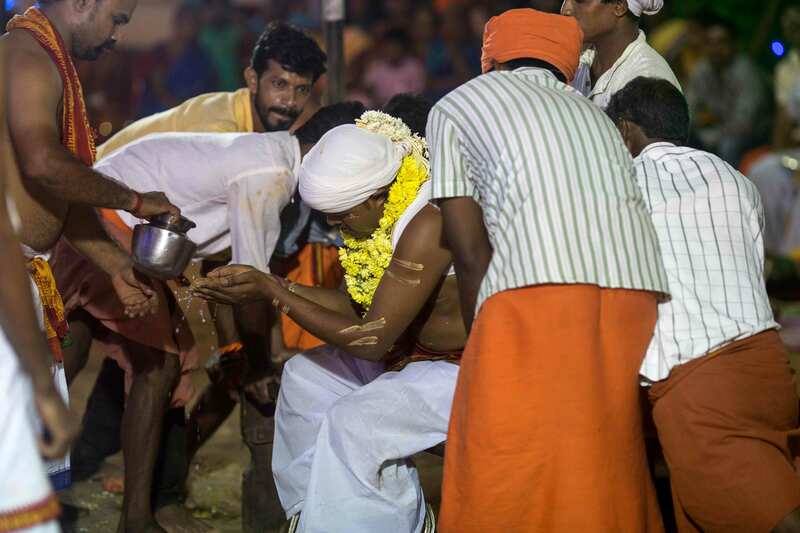 The villagers offer seva (voluntary service) during the festival and in doing so, also offer their support to the nema and recognition of the leader’s status. In return, the villagers expect justice and resolution of disputes by the bhuta. 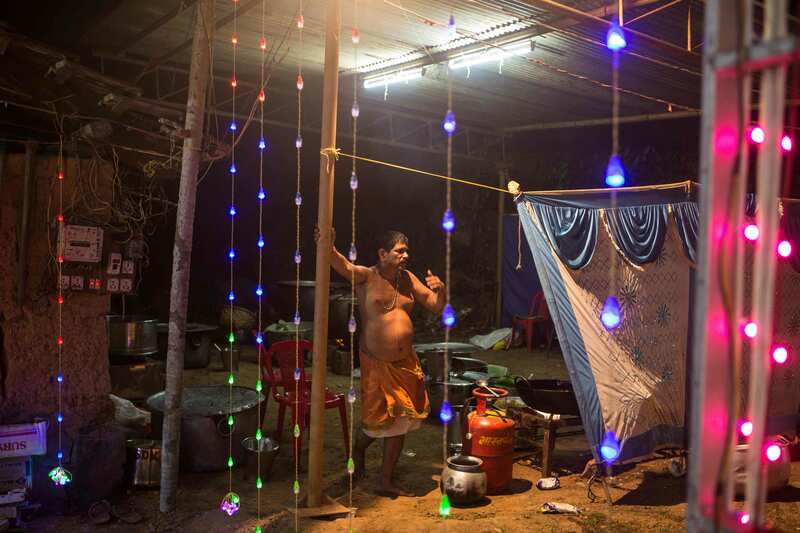 During the kola, the leading manors offer a part of their farm produce to the bhuta. 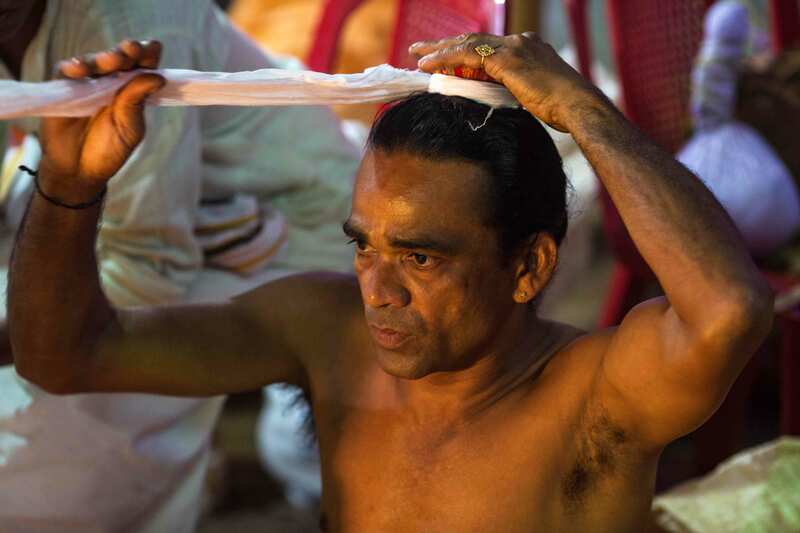 The bhuta in return showers blessings to ensure the future prosperity of the village (humans, animals, fields). Finally, a part of these offerings will be distributed as prasada (sacred food offerings) among the landlords and other villagers according to their ranks. Through this kind of conflict resolution, the bhuta, the guttu (manor heads), and the villagers form a transactional network which reaffirms the caste hierarchy and power relations in a village. As the cosmology underlying the paddanas suggests, the very order of the human world and the order of the spirit world are interdependent. The Bhuta-Kola thereby underlines the mutuality on which feudal relations were based, and, in a limited way, takes care of the problem of social justice.